’Not enough toilets.’ Decades ago, this was apparently put forward as an argument against hiring women at a university science department. Today, the notion is so preposterous it seems hard to imagine these views persisted within our lifetimes. Yet this was one of the anecdotes shared at a Royal Society of Chemistry (RSC) event, Celebrating diversity in the chemical sciences, which was held on 13 November to commemorate the 150th anniversary of Marie Curie’s birth. The meeting highlighted how much progress has been made in ensuring that science is a diverse enterprise – one that offers career opportunities irrespective of characteristics such as gender, ethnicity, sexual orientation or disability. It also exposed the huge challenges that remain. Globally, only 28.8% of research scientists are women, according to the Unesco Institute for Statistics; in the UK, the figure stands at 38.1%. That undoubtedly represents a significant improvement since Marie Curie’s day. Dig into the statistics, though, and a more troubling picture emerges. In the UK, about 43% of chemistry undergraduates are women – but as their careers progress, the proportion in research drops off precipitously. Fewer than 10% of chemistry professors in the UK are women. Meanwhile, factors such as disability, sexual orientation and socio-economic status have received much less attention than gender disparity. Despite the successes, much more effort is needed to make science truly inclusive. At the event, RSC president John Holman neatly summed up why diversity in the workplace matters. There is a moral case for fairness, that everyone in society should have equal access to a career in science. But there is also a practical argument: diverse organizations are less likely to suffer from the sort of ‘group think’ that thrives in monocultures. Diverse teams tend to be more creative and consequently produce better results. For many years, much of the strategy to improve gender diversity has focused on recruiting more women to science. Although that is still not a solved problem, attention is increasingly turning to retention and promotion – staunching the leaky pipeline that sees women leaving research before they have the chance to reach senior roles. Childbearing undoubtedly has an influence on this. In 2014, a Royal Society report found that after taking a career break to have a baby (including maternity leave, but also longer parenting breaks), only 20% of women in science returned to work full-time. One key problem is that a career break leaves a gap in a researcher’s publication record, making it harder to win jobs and promotions. It doesn’t have to be that way. Employers in academia and industry are becoming more willing to help their staff with flexible working, shared parental leave and career breaks. Indeed, the Athena SWAN project was set up to recognise such efforts to tackle gender inequality in university departments. Meanwhile, the Daphne Jackson Trust offers mentoring, retraining and other forms of practical support to help scientists return to research after a break. Women are not the only group to benefit from such initiatives. Embedding equality principles into the workplace can help to improve inclusion for many other minority groups. If the Athena SWAN programme spurs action to help female scientists manage their careers and family lives, it can also help a gay man to negotiate parental leave, for example. Similarly, the Daphne Jackson Trust has helped scientists with disabilities to develop the skills and the support network they need to return to work after a long career break due to ill health. No single solution can remedy this situation. Multiple changes are needed across all organisations in science and the RSC meeting raised a wide range of options. Science needs more mentors who can offer advice and encouragement to early-career women and other minorities in science. A more proactive relationship, known as sponsorship, can have an even bigger impact on inclusion. Senior scientists can actively help to advance their protégé’s career by promoting their work, preparing them for new challenges and putting their name forward to review research papers or speak at conferences, for instance. One of the strongest messages from the meeting was that change has to come from the top down. Those in senior roles should look at the diversity of their research group, their department, even their faculty meetings and work to improve it. Funders can also set expectations. Diversity and inclusion are considered in the Research Excellence Framework, while the Engineering and Physical Sciences Research Council (EPSRC) now aims to have a 60:40 gender balance or better on its Council and Strategic Advisory Network by 2020. More dialogue between academia and industry would also help to share best practice. Many businesses working in the chemical sciences have adopted inclusion processes, such as ensuring that interview panels are diverse, and providing unconscious bias training for staff. More dialogue between academia and industry would also help to share best practice. Many businesses working in the chemical sciences have adopted inclusion processes, such as ensuring that interview panels are diverse, and providing unconscious bias training for staff (see Chemistry World, July 2017, p16). We also need to routinely track progress on diversity. 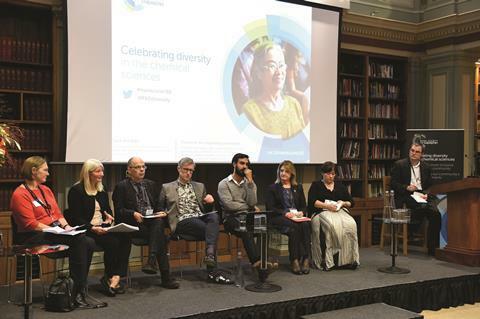 In February, the RSC will launch a report on the diversity landscape in the chemical sciences, which will hopefully show exactly where the field stands, how much progress has been made and where it’s headed. Many of these arguments must be depressingly familiar to those working to improve diversity in the sciences. But clearly they bear repeating, over and over again, until change comes. What elements are on your bucket list?